2018 Jean O’Connor-Snyder intern Nicole Gardner reflects on a long-standing third space in the community of Marion, Alabama. In downtown Marion, just off of the square, resides a small store with the American and Irish flags waving out front just under a sign that reads “As Time Goes By”. On weekends, a man with a beard sits outside the door in a wooden rocking chair smoking a cigar and reading a classic novel. This is the owner of the store, Charles Flaherty. Charlie, as most people call him, has lived in Marion for 15 years now. Like many non-native Marion citizens, he came to town to take a job. He worked at Judson College on the maintenance crew. While working, he dreamed of opening a used book store and coffee shop and that vision eventually came true. Although most people refer to the store as “Charlie’s,” the actual name, As Time Goes By, captures the entire essence of the store. It was inspired by a song made popular by the movie “Casablanca”. Inside, Charlie created a theme of time with tables decorated with newspapers, magazines, and pictures from each decade starting in the 1920s. This creates a timeline that wraps around the perimeter of the store. Each table also has pictures of Charlie’s family from that decade. “Nostalgia never gets old” is printed at the bottom of each menu. The shop is filled with hundreds of books that Charlie has collected over the years. He even has two more locations for the books he cannot fit in his store. In addition to great décor and books, “As Times Goes By” also serves coffee and pie, creating a welcoming and cozy environment. In almost seven years, Charlie admits he has not made a profit on his store. It serves almost entirely as a meeting place for Charlie and other members of the community. “People come in, and I find out what’s going on around town, you know. I hear stories. I get to meet friends. So, this is how I socialize,” Charlie said. Visitors, like Reginald Walker, who goes by Preacher, stop by the store to play chess. “Another gentleman used to come here with his dad, and we would play chess all the time together,” said Walker. During store hours, people stop by to buy books, eat a slice of pie, or just to say hello. “As Time Goes By” also serves as a venue for events that he regularly hosts. On the first Friday of every month, Charlie hosts the First Friday Jam where local folk artists play live in the store. “I’m amazed at how much talent is just out in the middle of nowhere,” Charlie said about the monthly jam session that highlights local Blackbelt artists and gives the people of Marion something to do on a Friday night. He also hosts other events, such as monthly kitten nights, where he brings in kittens from the local vet that roam around the bookstore as Charlie persuades visitors to adopt them. During the spring and fall, the store hosts Gaelic classes. On occasion, he even hosts fundraisers for the Marion Military Institute Gaelic Club to help send students to Ireland to study the language, and he also collects toys for Toys for Tots. 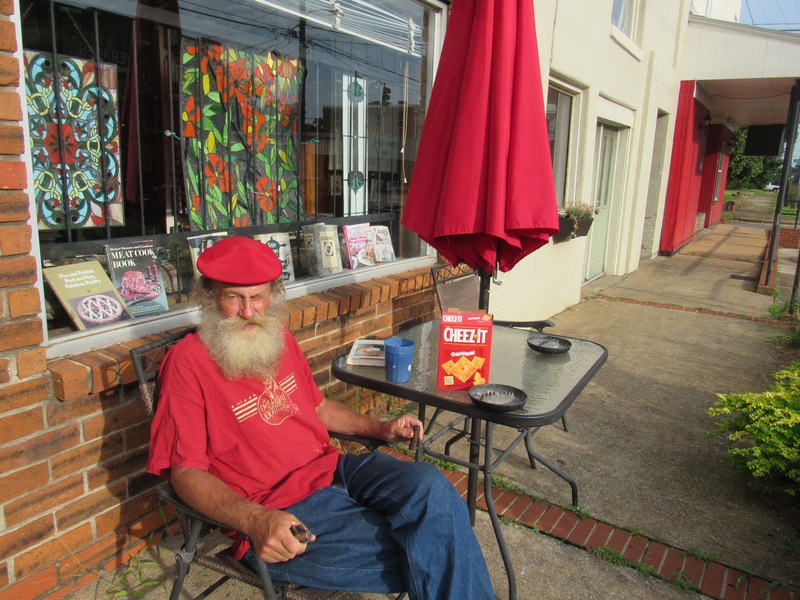 “As Time Goes By” serves a connector in Marion by providing a common foundation of books, coffee, folk music, Gaelic language, cats, or whatever event Charlie thinks of next.